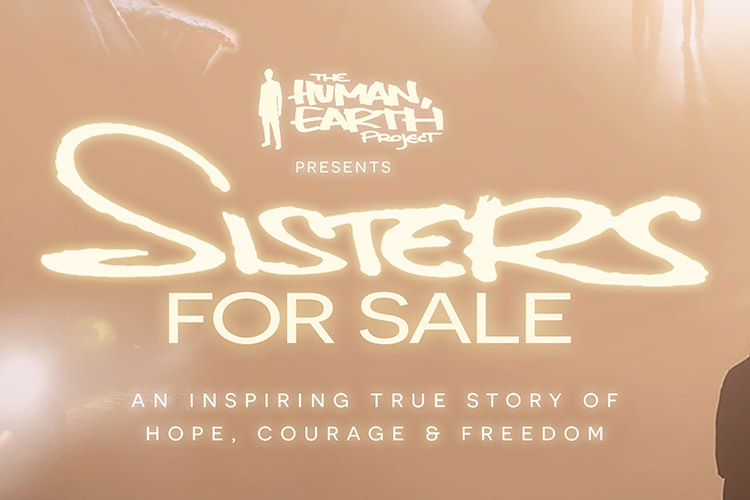 It has taken more time than expected to finish our feature documentary, ‘Sisters For Sale’, and you’ve all been waiting very patiently. Today I want to give you a special sneak peek at what we’ve been working on. I’m sharing a piece of the introduction, from near the beginning of the film. It’s not quite finished yet – the audio hasn’t been properly mixed, and there are still some sound effects to be added, but it’s getting very close. The reason I’ve chosen to share this particular part with you is because it includes one of the many beautiful pieces of music written and performed by Johanna N. Wilson for the film. 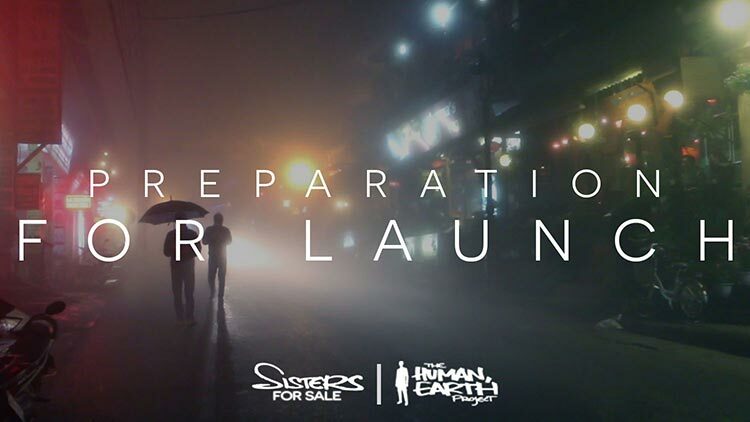 Some of it will look familiar to those of you who saw the 40-minute Little Sisters version of ‘Sisters For Sale’ in late 2016, before the editing, colour correction, and music were finalised. At 86 minutes, the final version will be more than twice the length of the Little Sisters version, and include a huge amount of material never seen before. It’s an exciting time for us. Johanna and my brother, Will M. Randall, are delivering the finished score for the documentary this week, then the film will be ready for the last stage of post-production: the final audio mix. With much of the work already done, the audio mix is expected to be completed in a matter of weeks. Here’s the video (if it doesn’t appear below, you can find it here) – enjoy! 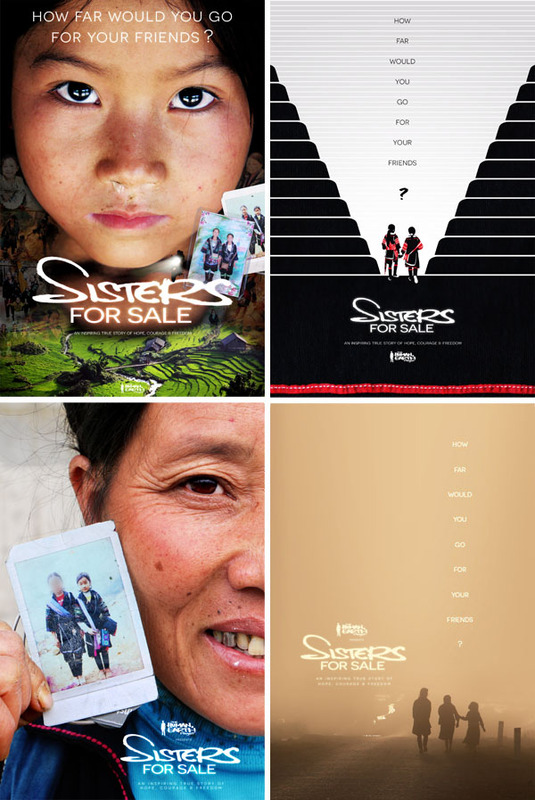 In April, I asked you to choose between four poster designs for our feature documentary, ‘Sisters For Sale’. Each of the four posters had its own group of die-hard supporters, but the fourth design – the ‘Sunset Glow’ design – proved the most popular. I liked the design, but there was something that bothered me about it. It was clean, bold, and simple – but there was no real depth to it. I wanted to print some large-format posters. Though the ‘Sunset Glow’ design looked fine on a computer, I didn’t feel it would translate very well to a bigger size. I’d hang it on my wall, yes – but I’d never really look at it, because there’s not much there to see. You could take it all in at a single glance, and have no real reason to ever look at it again. I wanted to give people something really special – a more engaging design, with more to explore visually. Call me a perfectionist, but I’m really glad I persisted with it. Using the ‘Sunset Glow’ poster as my starting point, I began developing a new design – the ‘Mountain Mist’ design. This was by far the most involved poster design to date. It became a team effort spanning several months, and I’d like to thank Melissa Adams, Katie Carriero, Claire Harris, Geoffrey Hindmarsh, Astrid Hofer, Myste Laquinta, Susan Randall, and Karina Thomson for all their assistance. The result is both striking and subtle, combining the most powerful elements of the four previous designs: the instant engagement of the ‘Cinematic’ design, the sense of sisterhood of the ‘Classic’ design, the naked humanity of the ‘Mother’s Love’ design, and the powerful visual imagery of the ‘Sunset Glow’ design. The ‘Mountain Mist’ design looks good on a computer, and looks fantastic when printed on a larger scale. I really enjoyed making it, and consider it one of the best designs I’ve ever worked on. I love the atmosphere of the design, and feel it captures the essence of the film far better than any of the previous designs. There are sympathetic women (some strong, some vulnerable), menacing-looking men, and plenty of unanswered questions. Framed by a dark, classically-shaped archway, the elements fit together in unexpected ways to form an intricate world of light and shadow for you to explore. I have a large test print on my wall at home, and still find myself captivated by its detail and textures. Everyone who has seen the poster in person has loved it. Though it’s not the same on a computer, I’ll give you a quick tour, so you can see what makes this poster so special. 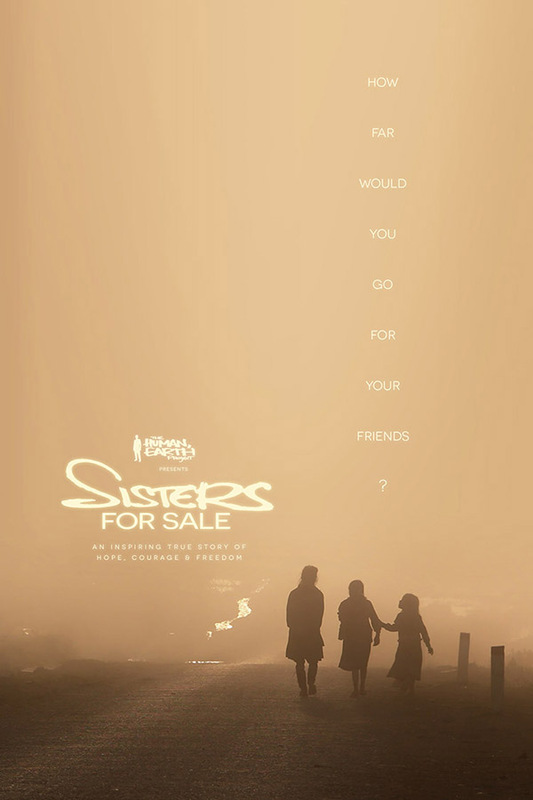 ‘Sisters For Sale’ follows my (unexpectedly successful) investigation into the disappearance of my friend May. May was kidnapped from her home in Sapa, a mountain town in northern Vietnam. Sapa’s pervasive mist has been used throughout the documentary as a visual metaphor for the mysterious and unknown. Two of the key figures from the investigation – May’s father, and one of her closest friends – can be seen above the title as ghostly figures in the mist. 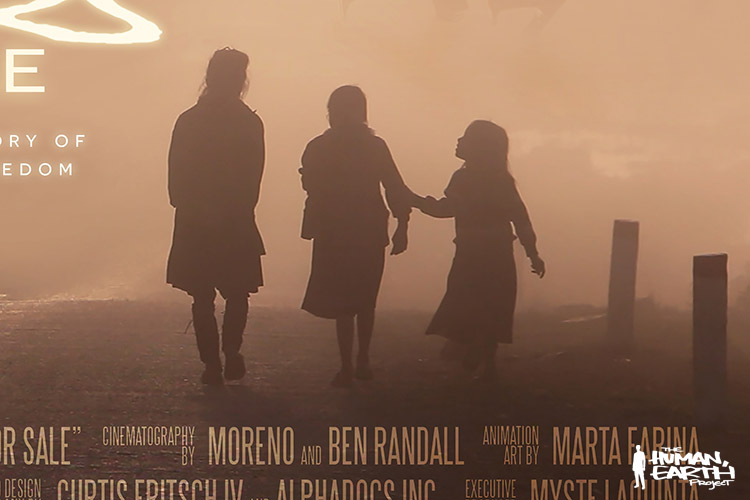 In the foreground, the three women from the ‘Sunset Glow’ poster walk down a long road which disappears into dense fog. This is one of my favourite images from the documentary. Here, it becomes a metaphor for the uncertainty of life, and particularly for the life of women in Sapa. Each of the women is at a very different stage of her life: there is an older woman, a teenager, and a younger girl who looks to the others for support. Beyond them, a Hmong man aggressively pursues a teenaged girl in traditional costume. Here, as in many places, the image is enhanced by subtle details – such as the vague shadows the running figures cast on the mist which swallows their feet. 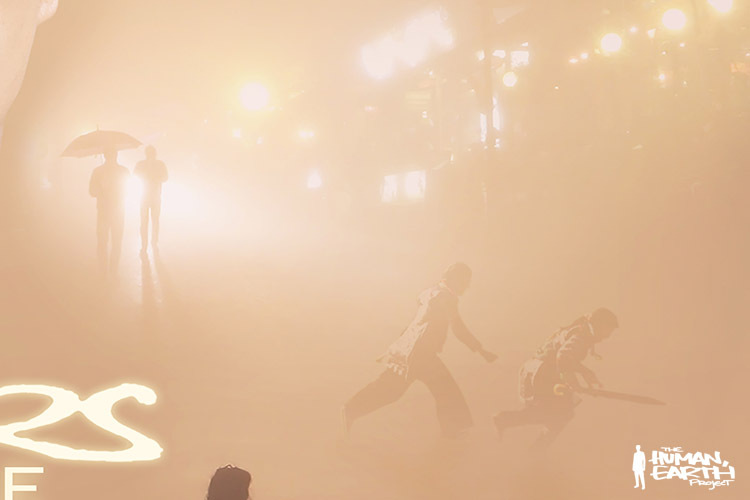 Two men emerge from the mist on Cầu Mây street. One of the principal streets of Sapa, this is where May and her friends once spent their days selling handicrafts to tourists, before May and four of her friends were kidnapped in separate incidents. The eyes at the top are my own and, while I had mixed feelings about including them in the design, I ultimately felt it was somewhat misleading not to represent my own role in the investigation. 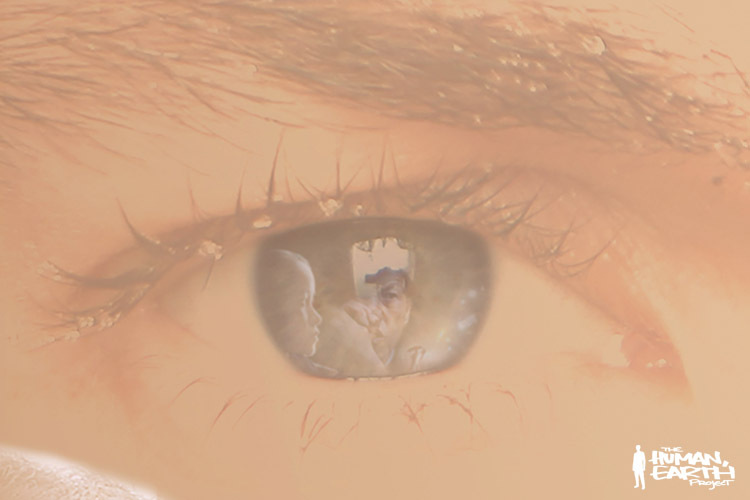 The faces and figures from the central part of the design are all reflected in the pupils, echoing the idea that the story is shown through these eyes. The photograph was taken after riding through the mists of Sapa – you can actually see drops of water clinging to the eyelashes, which looks great on the full-sized poster. At the bottom of the poster, I’ve included some of the key figures who made the documentary possible: Marta Farina, Curtis Fritsch IV and Alphadogs Inc. (I’ll introduce you soon! ), Laco Gaal, Jeppe Hildebrandt, Myste Laquinta, Moreno, Will M. Randall, Rami Shaafi, Michael Taylor, Johanna Wilson, and myself. 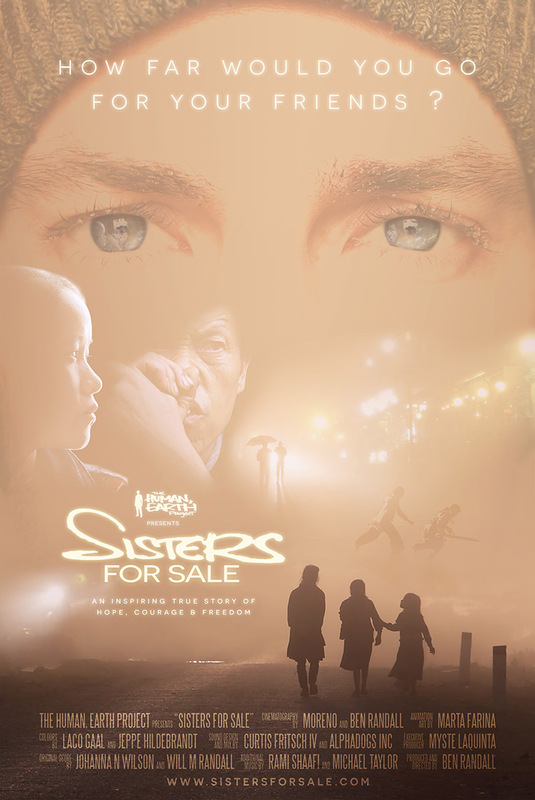 This is the final design, and will be the official poster for ‘Sisters For Sale’. We’ve just had them printed as large (61 x 91cm, or 24 x 36in) high-quality offset prints on 150gsm gloss paper stock, and they look gorgeous. If you’d like your very own print, you can order one here. Every order supports our work against human trafficking. For the next five days only – until Sunday 16th September – we’re giving discounted postage and handling on every order. I’d like to thank Myste Laquinta, who will be handling North American orders, and Leonie Brok, who has been helping with my European enquiries.